Reduce, sculpt and permanently remove unwanted fat effectively and safely with the Cristal ‘fat freezing’ treatment. 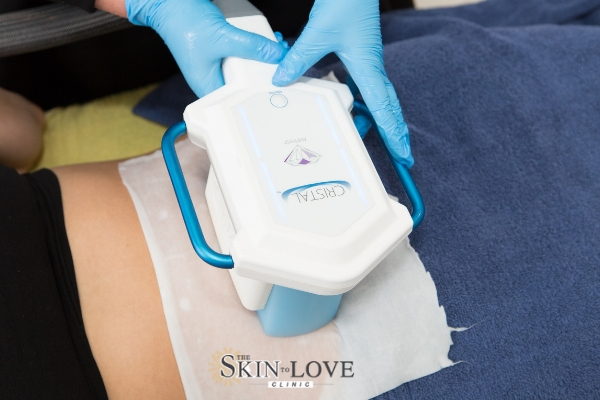 This non-invasive procedure uses medical standard cryolipolysis, a technology based on the evidence that fat cells are removed from the body when directly exposed to cold temperatures. During the procedure the Cristal technology gently vacuums the targeted fatty area and considerably cools it, without damaging the surrounding tissue, to bring about the death of the desired fat cells. The results of Cristal are permanent; the fat cells that have been treated are permanently removed from your body. We strongly recommend that you are at a steady weight and are following a healthy, balanced diet and exercise regime to compliment your Cristal treatment. Results cannot be seen immediately; the treated fat cells are gradually eliminated by the body over the coming weeks following treatment. Most patients see results from four to ten weeks post procedure, however, some start to see changes before this time, whilst others may be a little slower to respond. This is designed to be a single treatment, nevertheless, some patients decide to have additional treatments if they wish to boost their results even further. Each session of Cristal takes 1 hour per area. Medical cryolipolisis has a good safety profile. Consultations are an important part of the treatment process in allowing you to understand the treatment and to establish if the benefits of the treatment are outweighed by any possible side effects. During a consultation your characteristics, such as your medical background, the amount of unwanted fat and desired treatment area, will be assessed. Your medical practitioner will be able to discuss whether this treatment is appropriate for you, as well as any suitable alternative treatments. Your practitioner will discuss any possible side effects, questions you may have and any aftercare you should adhere to prior to you having treatment. How does the Cristal treatment feel? The discomfort level of this treatment is usually mild; during the procedure you may feel a tugging or aching sensation which patients find tolerable. Many patients find that this type of sensation reduces after about 10 minutes into the treatment. Immediately following the treatment, some patients experience a temporary aching sensation which is usually quick to pass. How will the treated area look after the treatment? Redness, mild swelling and bruising in the treatment area can occur post procedure. These effects naturally reduce within a few days, often hours following the treatment. However, bruising will last for as long as a bruise usually lasts for an individual. We recommend wearing loose, comfortable clothing around the treated zone immediately after your session to improve your comfort further. What happens to the fat after it’s treated? Your body gradually and naturally gets rid of the treated fat cells safely by your forager cells which consume the treated fat cells and naturally eliminates them. Rigorous clinical testing demonstrates that there is no impact on liver function and fat will not migrate to other areas. Will I lose weight after this treatment? This is not designed to be a weight loss treatment. Fat freezing is designed to sculpt and remove stubborn pockets of fat to give you a more streamline, svelte-looking figure. During weight loss the number of fat cells remain the same, but they shrink in size. Cryolipolysis permanently removes some of your fat cells in the treated area. How many sessions of Cristal will I need? Cristal is designed to be a single session treatment for those who are close to their ideal weight and who have stubborn pockets of fat they wish to remove. Some of our patients opt to have repeat treatments in the same area if they are not quite at their ideal weight or if they simply want to boost their results further. You can discuss this fully with your practitioner and make a treatment plan during your consultation. I’ve had Cool Sculpt in the past, what’s the difference between the two treatments? Both the Cristal and the Cool Sculpt treatment uses cryolipolysis technology. The Cristal allows us to use two applicators at one time from the same machine, at the time of publishing this information the Cool Sculpt device currently has one; some practices may have more than one Cool Sculpt machine allowing them to treat two areas at once, however, using double the amount of machinery may have a cost implication. What happens if I put on weight after my Cristal treatment? If you gain weight after you’ve been treated any remaining fat cells in the treated area, and generally throughout your body, may swell and increase in size. We always recommend that if you are considering this treatment you should make sure that you are at a stable weight and follow a healthy lifestyle. *Disclaimer: We are all individuals therefore results from treatments may vary from person to person, because each person responds differently. Results, down time and recovery following treatment will vary from patient to patient. The information we provide is based on the extensive experience we have gained from treating a wide variety of patients of different ages, genders and is based on an average patient experience.